Welcome to our post about our pet portraits engraved plaques. We have been working with a new engraving company in the last few months and they are wonderful. The previous company we worked with for a number of years moved premises. They sadly didn’t engrave any longer which was such a shame. They started to use laser engraving instead. There is a difference between laser engraving and traditonal engraving. We like both and have used laser in the past and can still offer this to our clients, however our personal preference is traditional engraving. 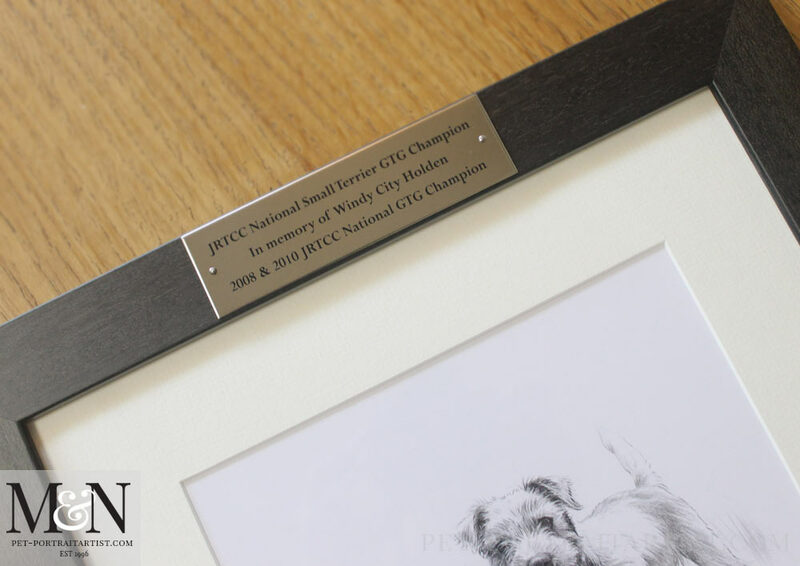 Recently a returning client requested a framed print of their portrait to use as a perpetual trophy for their Terrier group. We used the new company for her plaque. We had a print made back in 2011 as a perpetual trophy so that each year they could engrave the winner on a plaque and attach it to the framed print. 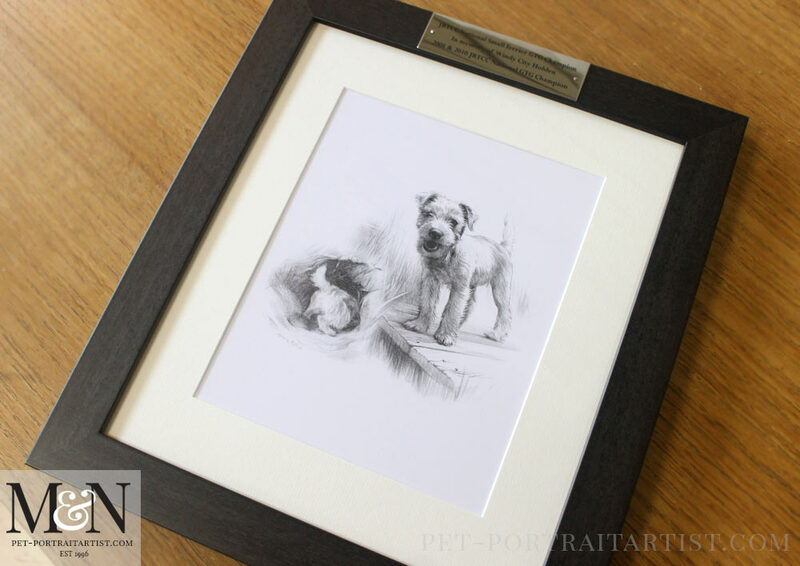 The print was taken from an original drawing of ‘Holden’ and you can see his portrait on my website under Jack Russel Pencil Pet Portraits. Using photo editing software I took two of the studies from my pencil portrait and placed them together as a design for the print. It was also framed by our wonderful framer Amanda. I have added a close up photo of the plaque below so our readers can see the quality. The plaques are either mirrored stainless steel silver or mirrored brass / bronze. This particular example is the stainless steel option. The actual weight of the plaques are superb, really wonderful quality. They are usually held in place by silver or bronze pins however we have also used super strength double sided tape for very narrow small plaques too. Both colours of plaques work well with all of our portraits and frames. The plaques are natural in tone and blend in well and never overpower the portraits or the text. This is really important as you want to read the writing and not be distracted by the plaques colour behind. All of our frames are suitable for plaques. Most of our frames have a flat surface for the plaque to sit on. If you are ordering an ornate frame, our framers can custom make an area into the frame for the plaque to be added. Our framers are essentially artisan crafts people and carpenters. They work with wood on a daily basis hand crafting frames for prestigious galleries around the UK. 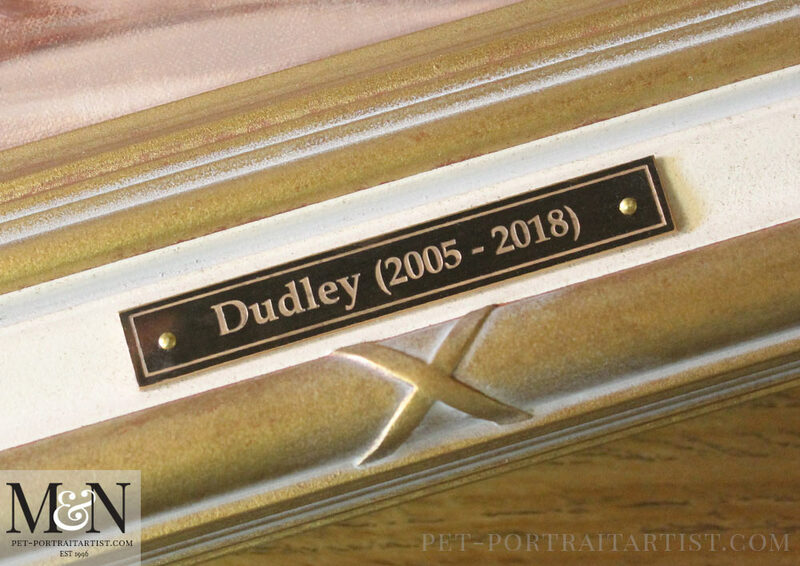 Pet Portraits Engraved Plaques – Borders! Our engravers can also create borders on the plaques so that it isn’t just plain text. We usually ask for our plaques to have a fine border around the outside to add a bit of interest as default. As you can see from the two engraved plaques below, they both sport the border detail. Each plaque is slightly different depths to work with their frames. If you have any ideas for your plaque please do let us know. 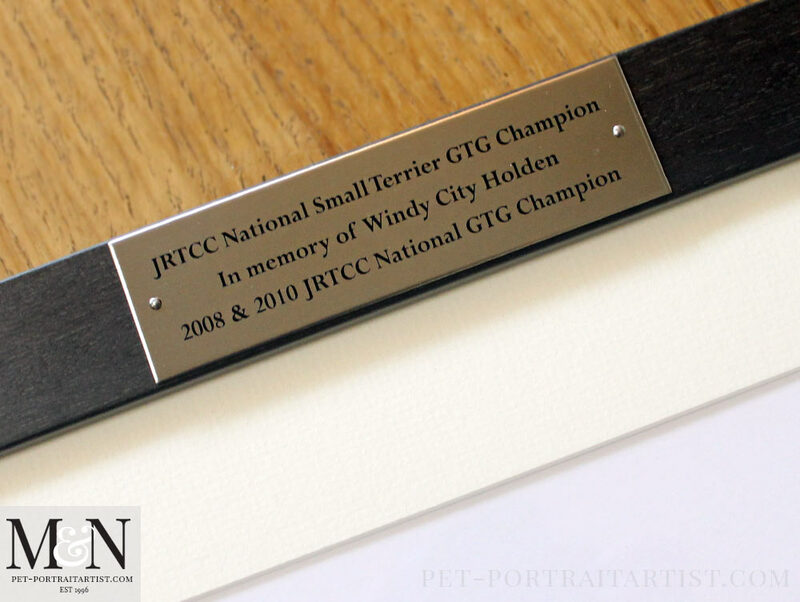 We hope that you have enjoyed viewing our engraved plaques for our pet portraits. Let us know your ideas for a plaque for your pet portrait along with the text. 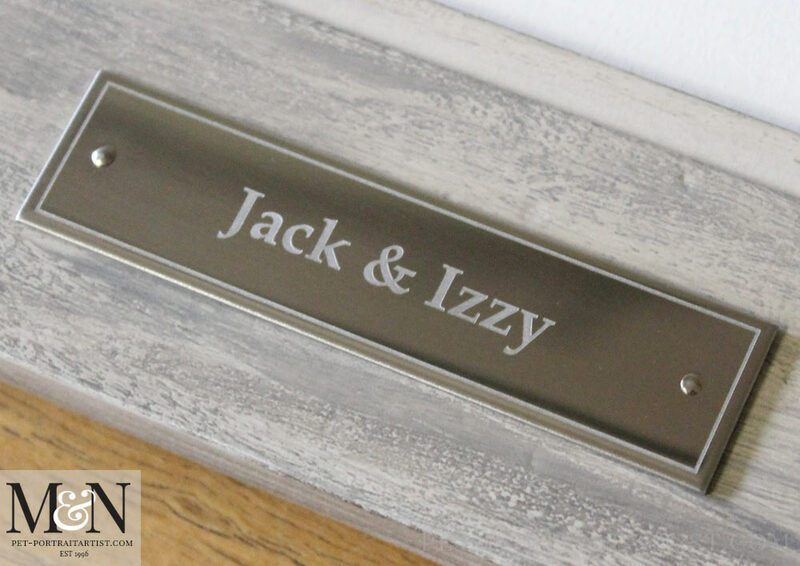 We can advise and help you with your framed pet portrait with engraved plaque at any time!